Home » Parenting » Family Time & Traditions » Birthday Traditions for Kids that are Meaningful but EASY to Pull Off! Birthday Traditions for Kids that are Meaningful but EASY to Pull Off! Have I told you ALL THREE of my kids’ Birthdays are between the end of November and the end of December? When November and December hit and I’m overwhelmed and exhausted from all the school concerts and parent-teacher meetings and holiday shopping and Birthday gift wrapping and, and, and… I tell anyone in earshot. And anyone on the interwebs…. About my kids’ Birthdays. And how they start right after Thanksgiving and continue (THREE TIMES!) until just a couple days after Christmas. And then… I’m done. And broke. I guess I’m trying to explain away my blank stare. My frazzled nature. Maybe even trying to gain sympathy? I’m not sure. But I tell YOU this so you know… I do EASY Birthday traditions. This mama cannot fit in elaborate Birthday traditions for kids when there are three of them in a near one month span overlapping Thanksgiving and Christmas! So let’s talk EASY. Because isn’t easy usually more meaningful anyway? 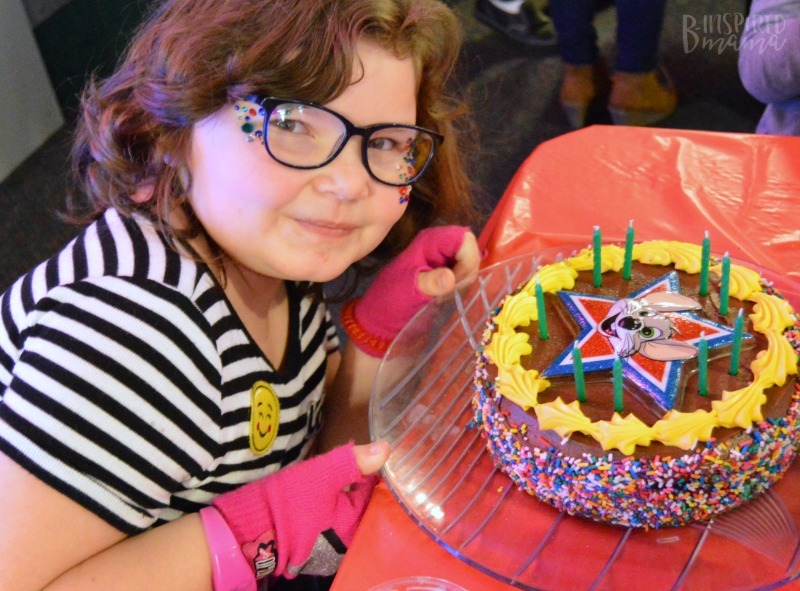 When we skip the elaborate, over-the-top Birthday planning and embrace simpler Birthday traditions for kids, we are also saying no to more stress and instead inviting more connection with our special Birthday child. This year, I’ve had the help of B-Inspired Mama sponsor, Chuck E. Cheese’s to keep this Birthday “season” easy and meaningful. 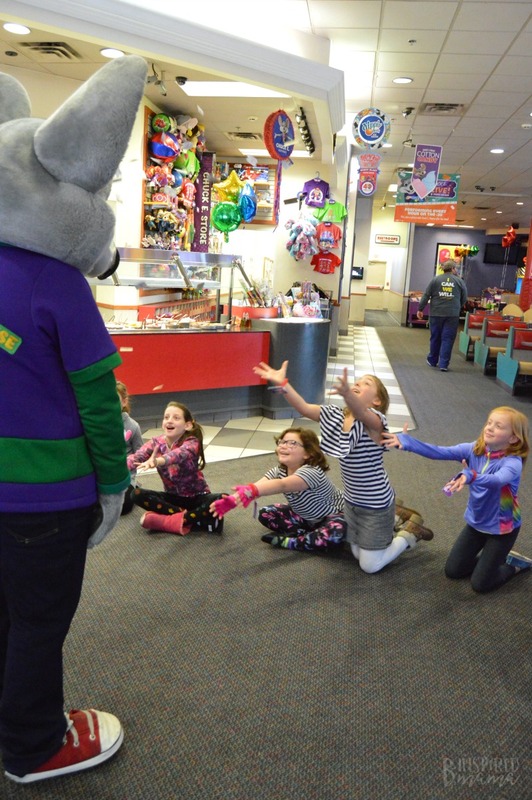 Sure, Chuck E. Cheese’s Birthday parties might seem elaborate and are over-the-top FUN! But they totally fall into the EASY category, and I’ll tell you why in a minute. 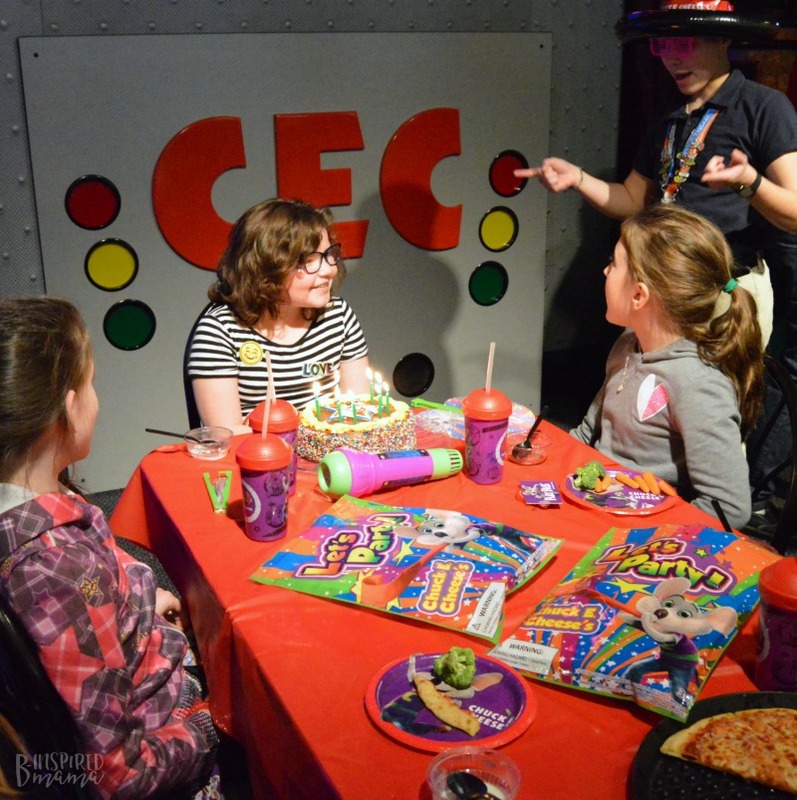 Check out some highlights of Priscilla’s Chuck E. Cheese’s Birthday Party Fun in the photos throughout this post! This is a sponsored conversation written by me on behalf of Chuck E. Cheese’s. The opinions and text are all mine. Please see my disclosure policy. 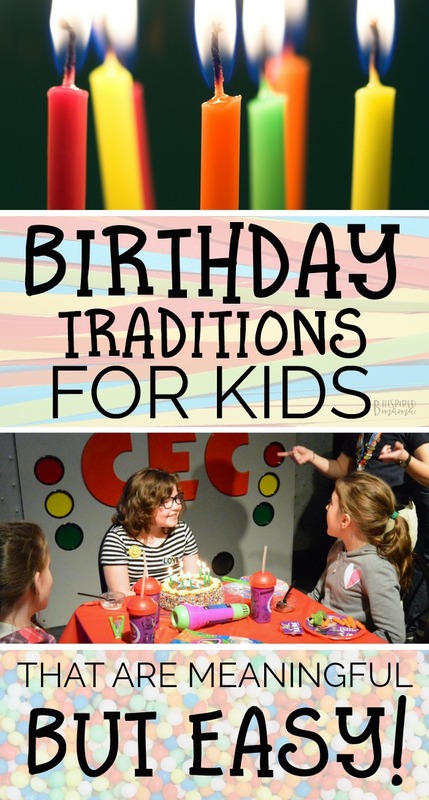 Birthday Traditions for Kids that are Meaningful but EASY! We have just started implementing this Birthday tradition in the past couple years. And I’m SO glad we have. Having just a few close friends attend the kids’ Birthday parties has resulted in less stress for me and a more meaningful Birthday for the kids. Plus, we are able to do something more fun (and sometimes more expensive, but that’s not always necessary) with fewer kids. Here’s a disclaimer, though: Be mindful of school rules and etiquette. My kids’ classes have rules regarding party invitations; there must be one for every child in the class. Which I actually agree with. So when we are only inviting a few friends, I just hunt down the few parents outside of school to do the inviting. And I also have talks with my kids to make sure they are considerate of their classmates’ feelings and do not talk about their party in front of kids who weren’t invited. It’s a good lesson for them actually. We all have a video camera in our hand all the time now with our smartphones. So when it comes to Birthday traditions for kids, this one really doesn’t take any prep or planning at all! Just hit record and give your child a simple Birthday interview by asking them their name, the age they just turned, and a couple fun questions like… What do you want to be when you grow up? If you could have any superpower what would it be? Who is your best friend? What is your favorite toy or book right now? The fun will be when you watch last year’s interview before you do the new Birthday interview each year! 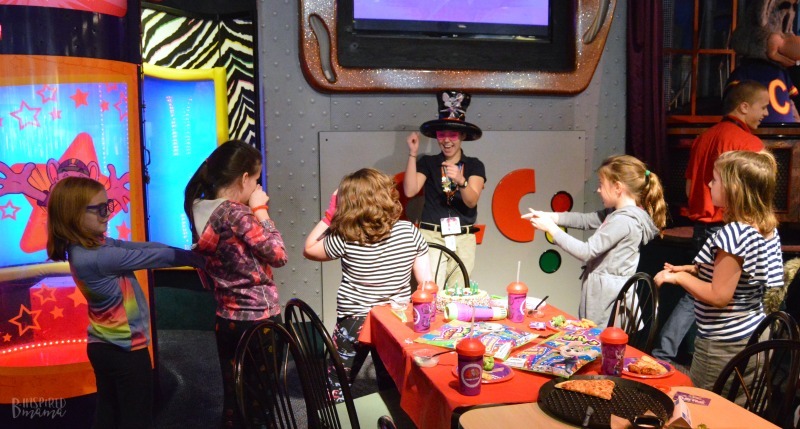 Chuck E. Cheese’s Birthday Parties have become one of our favorite family Birthday traditions. The kids love the fun and games while this mama loves the ease and convenience. With just a few clicks of your mouse, your child’s Birthday party can be scheduled through the Chuck E. Cheese’s easy online reservation system. 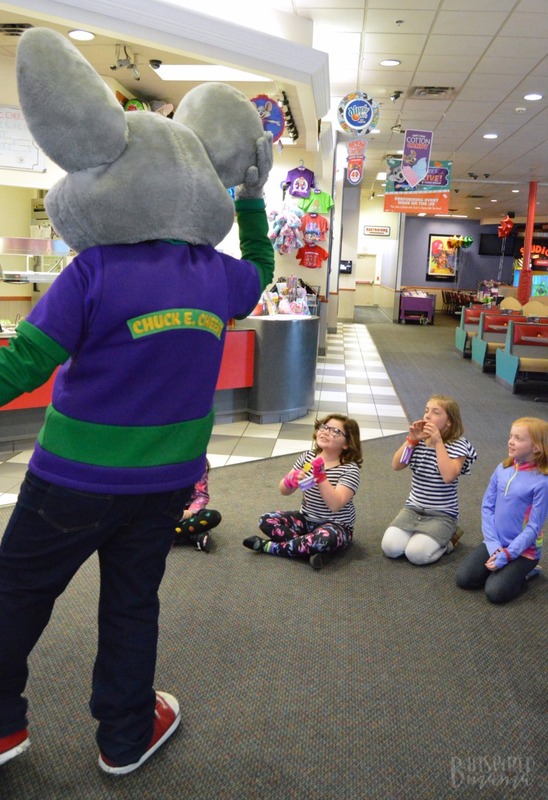 Chuck E. Cheese’s has new party offerings, too – each at different per-guest price points and including different food (i.e. yummy pizza, unlimited soda, new cakes, ice cream, Dippin’ dots, giant chocolate chip cookies) and party perks (i.e. goodie bags, ribbon pull pinata, new helium balloons, unlimited play), plus there are add-on options, too. But my suggestion… Even if you have to limit the guest list to just a few close friends to be able to do it (which is what we usually do as I mentioned above), go with the Mega Birthday Package that includes Unlimited Play for the duration of your party (2 hours). It’s SO worth it to not have to worry about kids running out of tokens or refilling Play Pass cards. Plus, the Mega Birthday Package includes pizza, soda, cake and Dippin’ dots for the kids, and lots more extras, too. So fun and EASY! My most treasured memories of my late Grandmother are the ones I have spending time with her in the kitchen. The smells that came from the oven. The licks I got of the icing from the spatula before we washed it. There is nothing like those sensory experiences to solidify sweet memories in a child’s mind and heart, is there? So here’s an easy baking-inspired Birthday tradition… Have your child help bake their own Birthday cake or cupcakes! Or you could have it baked and ready and let them use some simple store-bought decorating icing tubes to decorate their Birthday cake all by themselves! Surprise the Birthday child with a candle-topped Birthday treat for breakfast! Of course, after it becomes a tradition, it won’t be much of a surprise… but they will smile and love it every time. And it doesn’t have to be cake, either. Put a candle on a breakfast danish or sprinkle-covered donut. Or make a super easy Birthday “Breakfast Cake” out of frozen waffles! P.S. If you’re partying at Chuck E. Cheese’s, your kiddo’s going to LOVE the pizza! But there are some other options that are delicious, too. And they can choose which they want when you’re making the online reservations – Easy Peasy! 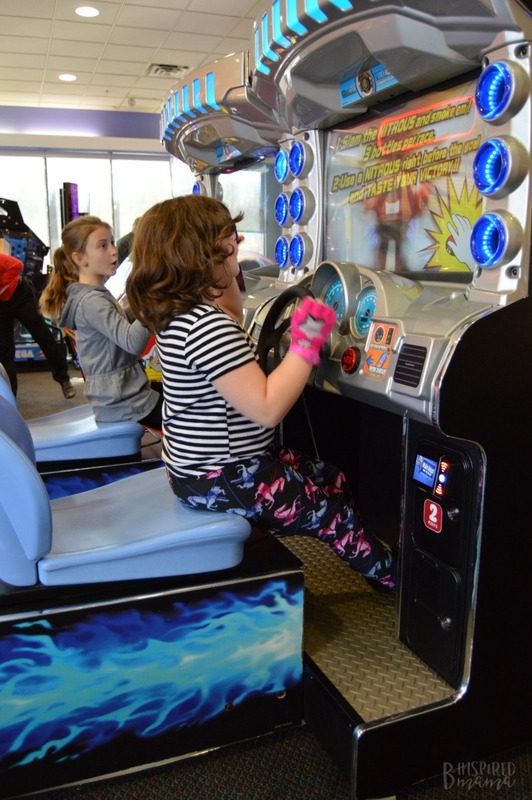 If you’re looking to add a Chuck E. Cheese’s Birthday Party to the Birthday traditions for kids in your family, check out their updated party offerings here and follow the Chuck E. Cheese’s fun on Facebook, Instagram, and Twitter. What Birthday traditions do you remember from your childhood? What Birthday traditions for kids do you have in your family? Share in the comments below!